This is second of my reviews following my recent trip to Abu Dhabi. Other articles cover the Hilton London Heathrow Terminal 4 hotel, the Business Class Studio on the new Etihad A380, the Jumeirah At Etihad Towers hotel in Abu Dhabi, the Etihad Premium Lounge in Abu Dhabi and the First Class Suite on the Boeing 777. This article is my review of the Etihad business and first class lounge in London Heathrow Terminal 4. I was in Terminal 4 for 6.15am and it was almost deserted. My brain had not yet engaged, however, and I managed to both forget to remove the liquids from my baggage and remove the coins from my trouser pockets, which is impressive. The Etihad lounge is opposite Gate 10. It is directly above the hugely impressive SkyTeam (and Priority Pass) lounge which means you need to take a lift to get to it. This always makes me think of the BA lounges at Gatwick which is never a good sign! 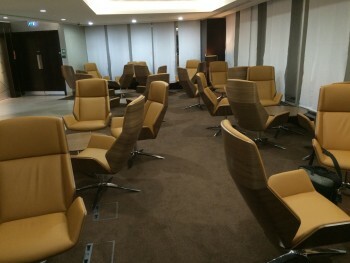 The lounge was closed over Christmas for a makeover as Etihad looked to upgrade its facilities before the start of the A380 services. 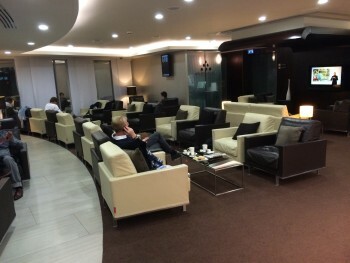 It is not a huge lounge but, given the number of passengers it serves, it is more than adequate. I would guess it is a bit smaller than the Qatar lounge at the other end of the terminal. There is no separation between what is offered to First Class and Business Class passengers. and found myself facing one of the most dismal buffets ever seen. Slightly thrown by this, I grabbed a yoghurt and headed to a table. Only then did a staff member pounce on me and give me a menu. This had a substantial selection of dishes on it, all cooked to order, and my mood improved substantially! I have no idea why they don’t leave the menus on the table in the first place. Whilst eating, I was approached by a therapist from the Six Senses Spa. I hadn’t noticed that the lounge even had a spa. Unlike the British Airways spa, where it is basically impossible to get a treatment unless you are flying in First Class and pre-book, Etihad had plenty of capacity and were keen that I indulged. It turns out that they have three therapists working at a time so, with relatively few premium passengers per day and 10-15 minute treatments, you should have little trouble being seen. An hour later I turned up for my appointment and had a neck and back massage. Post massage, I retreated to a chair and the newspapers. It is worth saying that I have never experienced such a high level of service in an airport lounge. Every 10 minutes someone would come along to see if I would like another drink or some more food, and this was on top of the pro-active efforts by the spa staff to get you along. The picture below was taken when I arrived – it got busier as departure approached! There is also a decent bar, with the level of custom you would expect at 6.30am! My overall impression is that this is a very well run lounge where the staff will take good care of you. 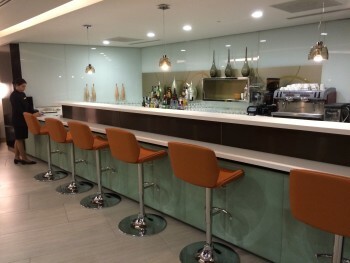 I didn’t get the sense that it offers the same gourmet dining or high end drinks that the Qatar Airways Premium Lounge offers (see my review) – that remains the classiest lounge at Heathrow in my view. This could be an unfair criticism, of course, since I was there for breakfast which is not necessarily representative of what is available for lunch or dinner. 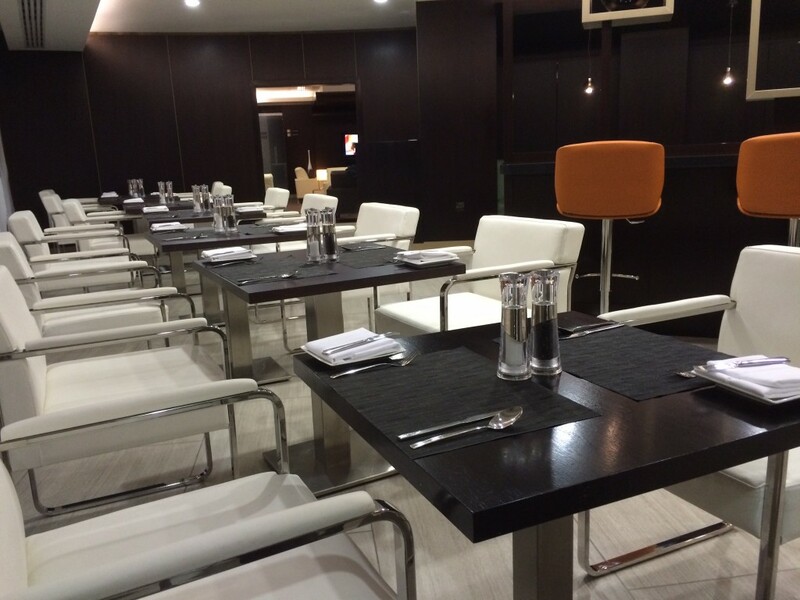 The Etihad lounge is a massive improvement on the Emirates lounge in Terminal 3 (review) which has little to recommend it apart from direct boarding to your aircraft. Etihad planes appear to depart from Gate 10, directly opposite the lounge, so when it was time to board it was a quick trot down in the lift and a 30 second walk to the gate. 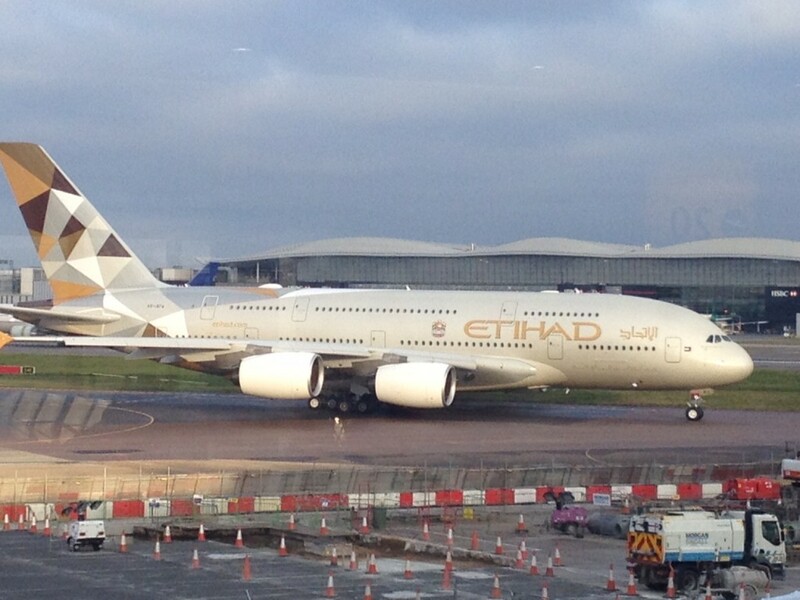 Annoyingly, because of the way the windows and the airbridges are laid out, it was impossible to get a photo of the one-and-only brand-new Etihad A380! Here is a photo taken by a HFP reader on the inaugural day in December – my review is on the way. Click here for the next review in this series – the Business Class Studio on the new Etihad A380. 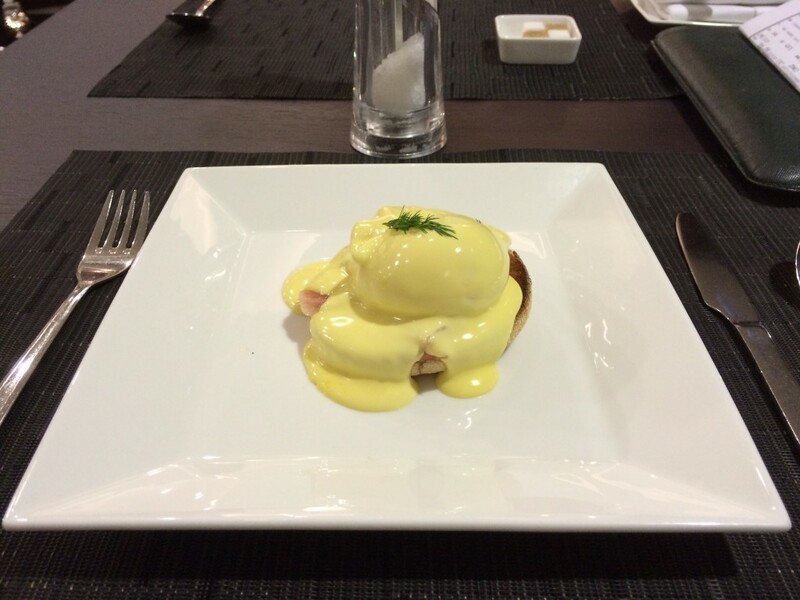 More photographs of the Etihad Premium Lounge at Heathrow can be found on our Instagram feed. 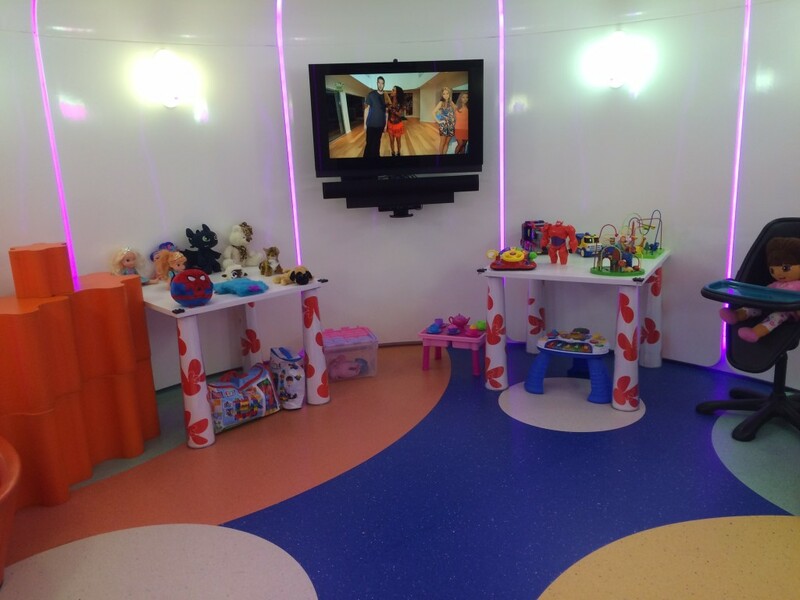 I tried the sky team lounge on the way out to Doha last Sunday, as you say very impressive. There’s a spiral staircase that I believe connects the two floors together ? I agree with you on Qatar – we were incredibly impressed with their offering when we flew to Manila over Christmas and the food in the lounge was just the starting point. I felt the offering and overall service was the best we’ve ever had in flying, and I’ve flown all the major airlines in F or J except Singapore and Etihad out of London. I’ve been in this lounge for the evening flight and thought it was excellent. There were nice stairs you could use instead of a lift. It was a lot busier in the evening and the service suffered as a result, but overall it was still much better than any BA F/J lounge. T4 has got a lot better too. I’m trying the oryx on Sunday ! Completely off topic – but Nectar are offering the chance to use 350 points (i.e. 1.75GBP) for ANY hot drink of ANY size at Caffe Nero! I think a large Latte is about 2.75, so you’re getting more for your points. I think Raffles needs to have a dedicated Nectar section on this site for deals like this, which are of great interest for the frequent flyer…. I think it’s a terrible offer! Spend £175 for a free coffee (£350 after the Sainsbury’s enhancement in April). They announced this via email today as if it was a big thing, yesterday they gave a teaser on Twitter which made me think they were going to do a Waitrose – but with everything to do with Nectar it’s a disappointment. Technically, assuming a £2.30 drink, you’d be getting 0.65p per Amex MR point. Better deal than most Amex MR redemptions. However, it looks like a massive faff. I have to order evouchers from the Nectar website and then give the voucher code to the person in the shop (I assume this are very long voucher codes!). I think not. The Starbucks app is fantastic. Buy Starbucks gift cards at Tesco for the bonus points, add to your Starbucks balance, use simply by scanning your phone in store (quicker than cash). And you get a free drink for every 15 you buy so effectively another 7% off as well. I used to go in Nero 3-4 times a week and then the Kings Road one closed down. To be honest, a medium cappuccino is about £2.30 (the large ones are pretty large if you tend to drink coffee all days!) so not a life changing deal! Don’t suppose Nectar have Passbook cards yet? I used this lounge on a late Saturday afternoon. It was very crowded. A fight broke out between some users – lots of shouting and a woman was attcked by a man and pushed over. There was a poor food selection available on the buffet but this may have been a result of so many people being there as plates of various cooked snacky type fare were being brought out. The staff were attentive but busy and it was easier to go to the bar to get your own drink. It felt rather claustraphobic and I’m surprised it has been recent renovated as it seemed a bit worn. Not a patch on BAs T5/T3 lounges. Yes, I’m bang on topic! It may be of interest, that those flying Mabuhay Class, or are Elite/Premier Elite members of Philippine Airlines, use this lounge, and their 5x weekly flight leaves between 1630 and 1745. May explain why it was busy late afternoon. They codeshare with Etihad on their Abu Dhabi to Manila flights, which explains why they can use this lounge? I like this lounge a lot. As a related aside, it is the main reason for an Air Malta upgrade sweet spot: upgrade to Business Class between LHR and MLA and you’ll get access to it. Combine that with the reasonable in-flight benefits and it’s a pretty good use of 10,000 Air Malta KMiles. I used the lounge a 3 weeks ago before an Air Serbia flight and have to say I was not that impressed. Staff chatting drivel loudly to each other (one of my pet hates). Food selection was poor compared to Qatar and to BA First. Underwhelmed would be my summary. They probably ramp up the service and the rota before the Etihad flights, which may explain why service was lacklustre before an Air Serbia flight. Nice review, thank you. I tend to use the Etihad lounge whenever I fly with Royal Brunei airlines on business out to Brunei and haven’t used it since they were in their old lounge UNDERNEATH the Sky Team one. Will be looking forward to the continuing excellent service and fabulous Sis Senses Spa once again in the new location.